It was going to be another eventful day for Suzie. Jacob fidgeted with his fork nervously. The kids had just gone out the door to the bus stop. Finally he looked at Suzie and said, "Look, you've been waking me up in the middle of the night now every night for three weeks…screaming bloody murder. It's a miracle you haven't scared the kids to death! And look at you! You look exhausted! He made his voice a high pitched wail and said, 'Help! I'm drowning! Help! The LinkedIn Icon just crashed into me! Oh no! It's a facebook tree!' It's nuts! I can't live like this. You need to go counseling, okay? There I said it." Suzie looked up from her computer and said calmly, "I already have an appointment. It's today." Jacob sighed relief. He stood up and accidentally knocked the bowl of apples over. They spilled all over the floor. Just then the doorbell rang. "Oh! That must be my friend Suzanne! We're having breakfast together. I almost forgot!" Suzie kissed Jacob goodbye and rushed out the door, hopping over the still rolling apples. "Suzie, remember when we were kids and when things got overwhelming we used to shrink them in our minds?…. Remember our first dance and we were scared out of our tree? We closed our eyes and imagined it really big and then moved it away making it smaller and smaller until we watched it vanish…Do you remember how it helped us feel like we had the power to do what we needed to?" Suzie lit up. "Yes, I do remember that!" "Try to get some time alone and see if you can't conquer this social media nightmare the same way!" It was a good breakfast except for the embarrassing moment when Suzanne knocked over the ice water and Suzie had to jump out of the way, knocking over her chair in the process. Despite that, she just felt so much better after the conversation with Suzanne. She walked up the concrete steps to the counselor's office wondering if she even needed her now. "That's interesting!" Suzie asked Dr.Daisy, "You know about social media?" "Yes, as part of my practice I help individuals plan their day successfully without compromising their health, relationships or business. As a matter of fact, I've written a book. It's Letting Go of Supermom.So Suzie…from what you are sharing with me, it seems that you are dealing with Social Media overload…First things first…what exactly are you trying to accomplish on Social Media?" "Well, I need to make ten facebook posts on my timeline, ten on my fan page, 15 tweets at the minimum. I need to make two LinkedIn posts, five Google plus posts, two blog posts a week, and a youtube video once a week." Suzie took a breath. "Then, I have to go and interact with everyone who left messages on all the social media sites. I also have to go like some of their posts and interact with them on their sites, personal pages, fan pages, Google plus pages, LinkedIn pages, and tweet and retweet and reply and say thank you, and…"
Dr.Daisy looked calm. Suzie stopped. "Gee, it sounds really crazy when I say it all out loud, doesn't it?" "What is the end goal?" "What do you mean? I thought I told you my goals?" "The purpose of all of those posts and tweets?" "Oh, the social media gurus say we have to do that to be in business online. Hmmm. That sounds kind of shallow. Well… I guess it's because engagement helps build a list of people I can market to. When people trust you, they are more likely to buy from you rather than from someone else. So I'm trying to give my business a good online exposure and engage my ideal client." "Okay great!" Dr. Daisy said. "Social Media will certainly help however, it's important to have a plan in place…by plan I mean time management strategy…does that make sense?" Write it down Suzie. Write it down! "So, this week I want you to start writing down what you want to accomplish each day. Here." DrDaisy reached behind her on the bookshelf to a pile of journals. She pulled one out for Suzy, and the whole pile tumbled onto the floor. "Well, I'll get that later. So, sit down with your planner, or use this journal." She handed it to Suzie. "Remember you must write everything down. Keeping it all in your head will make your head explode. Next week we'll talk about creating your target list.To prepare for that, highlight the activities on your list that you feel are highest priority. At the end of each day, check off those items you completed. You'll get it Suzie! I have a lot to share with you, but we can't do it all at once. Sound like a plan?" "It's a plan" Suzie responded. Later, Suzie was afraid to go to sleep, but she was so tired that she drifted off quickly. And there she was again, in the water surrounded by social media posts, tweets and icons. help for parents She was cold and drenched and frightened. The sky was dark and she could barely make out the shapes of trees. The wind began to blow and create huge waves in the water. She could see the branches swaying in the wind against the dark blue sky. Suzie began to feel seasick. The tree trunk she held onto the first night was long gone. She groped around in the dark for a floating facebook post to hold onto. "I wrote my list. This isn't working. Shrink nightmare, shrink!" She closed her eyes and tried to make the scene go away but she could still see it and feel it. But something inside of her felt stronger, just a little bit stronger, but enough that she was able to shout. It wasn't a wimpy shout like, "Oh no! The LinkedIn Icon hurt me!" No, it was a cry for help. "Help me! Someone get me out of here! Help me! Help me!" A what? A social media hero with a cape? Suddenly the clouds began to break up just a little. Suzie looked up. A beam of light shown through the clouds onto … what? What was that. She squinted, and then she saw what it was! A social media hero! It was Norma Doiron herself, standing there with her social media hero cape on! She had her foot firmly planted on a LinkedIn icon and she didn't even look afraid. "Well, pull me out of the water! What are you waiting for!" Suzie yelled desperately. Norma smiled. "I don't have to." "You have the power to pull yourself up. I'm here to cheer you on!" Suzie couldn't believe her ears. "I can't! I Can't! Please please help me!" Suzie stopped yelling. All she could hear was the sound of the water splashing against the shore, social media icons clashing in the water, and Norma's cape blowing in the wind. There was a gleam in Norma's eyes. 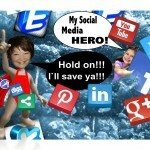 To be continued… Be sure to sign up so you don't miss all of the helpful social media and time management strategies Suzie learns so she can pull herself up out of the water! And you might find out why everyone keeps knocking things over too.